Jobs from 18-03-2019 to 18-04-2019. 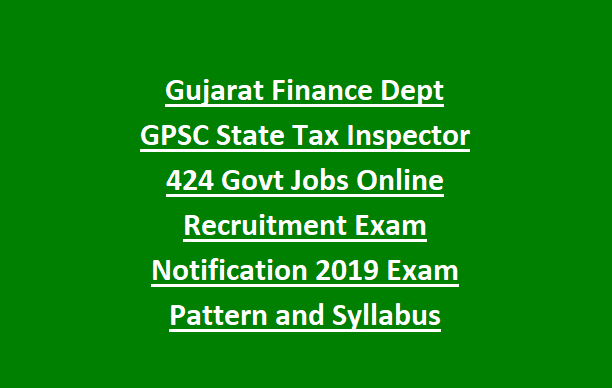 Official website to apply online for this GPSC STI recruitment 2019 is https://gpsc-ojas.gujarat.gov.in/. Selection for this GPSC State Tax Inspector recruitment will be based on prelims exam and mains exam followed by Interview. STI Exam pattern, STI Exam Syllabus, age limits, Exam pattern and Syllabus PDF and other details of this GPSC State tax Inspector recruitment is updated below. 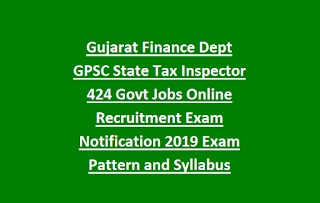 There are total 424 vacancies in this GPSC STI recruitment 2019. Age limits are 18-35 years for general candidates and for reserved candidates age limits are 20-40 years. Degree qualification and Computer Knowledge as per Gujarat Stage Technical Education Norms. Rs.100 for General Male candidates and EWS candidates. Candidates selection for this GPSC STI vacancies will be on basis of Prelims Exam, Mains Exam and Interview. Eligible candidates can apply online for this GPSC STI jobs online on or before 18-04-2019. Official website to apply online is https://gpsc-ojas.gujarat.gov.in.